When it comes to minimising costs after an incident involving a third party, timing and recording the right information are everything. Accident management provider FMG estimates that failing to capture third-party information can inflate overall incident costs by 965%, turning a £1,000 bill into a painful £10,650, while AXA Insurance has seen claims that should have been £5,000 spiral up to £50,000. Key to keeping these costs as low as possible is making the first notification of loss (FNOL) as soon after the incident as possible. “We used to have a saying, ‘don’t delay, report the same day’, but now it really is ‘report within the hour’,” says Doug Jenkins, motor risk control manager at AXA Insurance. If a fleet loses that race, it affects the entire claims journey, from validation, deployment of services and cost control of areas such as protracted vehicle repairs and costly hire car rates, to unpredictable personal injury claims and legal fees, as well as fraud. “If a claim is reported late, we lose the opportunity to , as the third party may already be in a credit hire vehicle, which can result in a significant cost,” says Rhona McGregor, head of claims relationship management at Zurich Global Corporate UK. The typical nightmare scenario when an incident occurs is that no attempt has been made to reach the third party, or the event goes completely unreported. “I’ve seen claims that should have been £5,000 go up to £50,000,” says Jenkins. “In one, the claim was put in by the client a month later with the driver thinking ‘there’s little damage, it’s all OK’, and then a few weeks later the third party claim turns up, with the claimant alleging there were more people in the vehicle and the vehicle was put into a particular repairer which racked up the cost. While the timing of reporting an incident is critical, so too is the information gathered at the scene. “Quality of information captured at FNOL is essential to the speed and success of the incident management process,” says John Catling, commercial director of FMG. “Poor management of incidents leads to claims leakage, where costs can spiral due to delays in authorising repairs, lengthy and protracted repairs that result in higher replacement vehicle costs and lengthy liability decisions. Insurance and incident management experts are clear that, as long as it is safe to do so, a driver’s first step following an incident should be to phone through to the relevant insurer or support provider, which will take all the necessary event details. Providers and some fleets such as Speedy Services (see case study on page 37) also utilise smart devices and smartphone apps which prompt drivers to input relevant incident details and take pictures at the scene. But whether drivers have access to incident management support or not, they should still be recording information at the scene. - Third-party name, address and contact details. - Witness/passenger name and contact details – ensuring they take note of the number of passengers in the third-party vehicle. - Smartphone pictures of vehicle positions at the scene, as well as close-up photographs of the damage. - Whether all vehicles were roadworthy following the incident. - Follow-up events – police attendance, witness assistance at scene, etc. Incident packs and ‘bump’ cards provide a simple way of prompting drivers to follow procedure after an incident, as well as ensuring both they and the third party have all the relevant details needed to for a speedy resolution. Packs can be stored in the vehicle and outline what a driver should do in the event of an accident, while cards can be stuck to windscreens and come with a check-list section to be completed by the company driver. They can both contain a corresponding pre-printed section with the fleet’s details and insurance information to give straight to the third party. Since it introduced a more structured reporting system and issued drivers with bump cards in 2011, facilities provider ISS (see case study on page 37) has seen reporting rates within the first hour skyrocket from zero to 80% of incidents. “Bump cards often prompt third parties to call us before contacting anyone else, resulting in an opportunity for intervention, and therefore further cost savings,” says Catling. However, it is not enough just to deploy efficient incident management procedures – be it faster reporting times direct to insurers, at-scene tools like smartphone apps and bump cards, or employing incident support. Drivers also need to understand how FNOL impacts on the business and its bottom line, and be periodically reminded of good practice. “It is important for fleet managers to continually educate their drivers on the importance of good and prompt reporting,” says Nick Williams, managing director of RAC Accident Services. Jenkins adds: “As it’s a company vehicle rather than their own, drivers aren’t always as mindful of how expensive things can get if the procedure doesn’t get followed. Technology such as telematics and cameras can provide a plethora of metrics to managers and insurers, helping to provide hard facts in the case of a disputed insurance claim. Jenkins says telematics evidence can “inherently speed things up or even make claims go away completely”, however, he urges drivers not to be overly reliant on camera footage at the cost of failing to record individual incident details. “Bear in mind the quality of video can vary, and you might find data isn’t always saved correctly, or you have issues with the SD card,” he says. McGregor adds: “In-vehicle cameras in particular are very useful when investigating the circumstances of an incident, however, they cannot capture everything. Finally, fleet managers need to ensure they are fully involved in the incident management chain, and take responsibility for their drivers’ understanding of FNOL. Jenkins urges fleet operators to have a regular FNOL process review to assess the lifecycle of claims, as well as monitoring the efficiency of any third-party incident management providers. Mugglestone says fleet managers should consider the benefit of using an incident management provider to handle FNOL. “We had one client whose average reporting time before they came to us was 42 days, and the average cost of the claim was over £5,000,” he says. In 2011, facility provider ISS introduced a new fast reporting system, encouraging drivers to report incidents to the fleet’s incident management provider within the hour, as well as giving them bump cards to exchange details with third parties. “Previously, reporting was via a network of fleet coordinators and line and contract managers whenever the driver got round to it,” says Nigel Rowden, UK fleet manager for ISS. 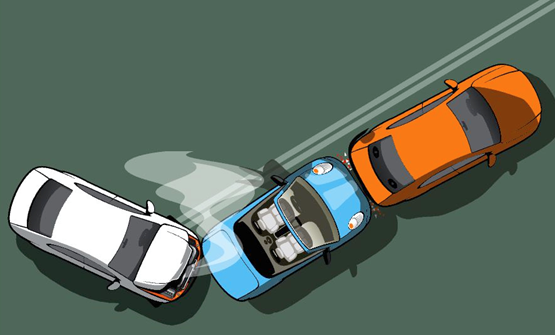 Immediately following an accident, its drivers are now required to fill in two sides of a bump card and give the third party their relevant half, before phoning through to the company’s incident management provider FMG. The driver then issues their fleet coordinator with the third-party section of the bump card. “Since implementing the new system, reporting within the ‘golden hour’ has gone from zero up to 80%, and up to 85% within the day – the missing 20% is usually due to no other vehicle being involved or third-party insurers claiming an ISS vehicle was involved but the ISS driver being unaware of the incident,” says Rowden. Commercial vehicle drivers at Speedy have been required since 2011 to log incident details at the roadside using a handheld PDA device. FNOL details are then sent directly through to Speedy’s incident management providers at Lex Autolease, who pick up the incident and start the process of contacting the any third parties, as well as the company’s insurer. The seamless reporting process has helped speed up claims for the hire giant. “In the past two years, 50% of claims have been reported within 24 hours, consequently reducing the cost of claims,” says Charlotte Roberts, fleet specialist (claims risk) at Speedy. Speedy is now in the process of replacing its handheld PDAs with newer smart devices, primarily issued to record daily operations and vehicle checks, but also to be used in case of an incident. “Drivers record as much information as possible at the scene, by following the on-screen instructions,” says Roberts. “The smart device will prompt the driver with instructions and details they need to obtain. “A drop down menu then displays: ‘Your details’, ‘Third-party details’, ‘Witnesses’, ‘Emergency Services’, ‘Scene details’, ‘Policy/recovery details’. Company car drivers, meanwhile, are required to call Lex Autolease direct from the scene of an incident, and are encouraged to take smartphone pictures as evidence. However, Speedy is planning to roll out an incident reporting app, modelled on its commercial driver protocol, for all of its company phones by October 2016. - Clarify the process for reporting between all interested parties i.e. drivers, accident management providers, transport managers, leasing companies/brokers, so everyone understands their role and responsibility. - Simplify – more steps in the claims reporting process reduce the likelihood of compliance. ‘One call’ solutions are the most effective. - Communicate a comprehensive claims management procedure to your drivers covering all types of incident with clear and practical steps that are suited to both your business and the structure of your organisation. - Promote an open culture in relation to the reporting of incidents for all drivers. Making it a ‘sin’ for drivers to have an incident will dissuade them from notifying claims and admitting liability when they’re at fault. - Educate drivers to understand the need to capture key data following an incident and provide it straight away. - Equip drivers to provide key information with supporting evidence from the outset. The earlier evidence is provided the more opportunity there is to defend effectively or recover losses. - Affirm the ‘need for speed’ when reporting claims. The earlier an incident is reported, the more effectively the resulting costs can be managed. Use the management information available to investigate whether drivers are adhering to guidelines.